Godofredo and Teresa Rubio are involved in pastoral care, teaching, counselling and evangelism. Godofredo has written the Life Course which is a five part evangelistic Bible study used extensively throughout Peru. 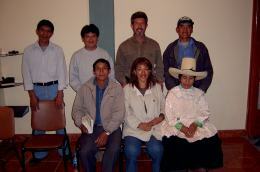 Recently they have been involved in a church plant in Curahuasi in the south of Peru. 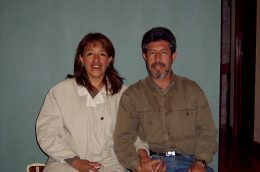 Godofredo and Teresa have been leading church planting in the Cajamarca area. Bright Hope World has partnered with Godofredo and Teresa since 2001. They were recommended by Guy Pembroke, an English missionary working in Cajamarca city. Guy and his wife, Jocelyn are known to Bright Hope World's South America Partnership Facilitator through previous missionary work. Godofredo is a gifted Bible teacher and evangelist and both these gifts have been used by God to plant churches in the Cajamarca region. Teresa has a significant input into the women's ministry in the area and is involved with Godofredo in giving marriage counselling. Godofredo is an elder in the local church. They live in the northern mountain area of Peru. This partnershiop primarily benefits the people in the city of Cajamarca and the regional towns of Cajamarca in the south of Peru. Through Godofredo’s talent of writing discipleship material and other Bible study materials, many Christians in Colombia have also benefitted. This partnership has a wide as well as deep individual influence. The influence is wide because Godofredo and Teresa reach the unreached throughout various regions of Peru, have planted five new churches in the area and spiritually teach and build up Christians both within Peru and outside of it. They have a deep influence through the individual spiritual input they have into the lives of local church members by way of pulpit teaching, marriage counselling and discipleship. They are key leaders in the church in Peru and has a passion to see new churches established in Peru. Godofredo is the contact for the other Bright Hope World partners in the Cajamarca region. He distributes the financial support to Serberino Malimba (PER13) and also requests the reports from Seberino and Jose Isabel (PER03a). Godofredo and Teresa have two adult daughters. Before committing their lives to Christ they ran a tourism business. Godofredo is an elder in the local church, “Centro Biblico”. Teresa has a ministry among the women of the church where she gives marriage counselling as well as being involved in evangelism of cities and towns both in the Cajamarca region and in coastal and southern regions within Peru. Godofredo and Teresa have a vision to plant new churches within Peru, to disciple believers and to train and build up the church to be a reproducing church. They want to identify towns and villages that have no current church and to evangelise those areas. There is also a strategy to identify areas in the south of Peru - they currently live in the northern mountain area of Peru - where there are opportunities to evangelise and see new churches established.